Ever since Volkswagen Group confessed last September to cheating diesel emissions tests on an unprecedented scale, Europe's auto industry has scurried to contain the reputational fallout from the public health risk and to deflect criticism from a technology deemed critical to meeting CO2 reduction targets. Facing an uphill battle to preserve support, automakers have rallied around one simple message: The latest Euro 6 diesels into which they have sunk billions of euros are among the cleanest, most efficient around and without them there would be no chance of curbing fleet CO2 emissions to the mandated 95 grams per kilometer by 2021, down from 119g/km last year. But a cloud of suspicion has descended on the industry that has left automakers struggling to shape the public debate. More red tape, stricter testing regimens and greater scrutiny as a result of the VW Group's fraud are only the beginning. "Currently we don't have the four-eye principle, it's more like the six or eight-eye principle," Audi's new development boss, Stefan Knirsch, told reporters last month, adding that his engineering team at the VW Group subsidiary was re-examining every internal process, not just those dealing with emissions after treatment. EU Commissioner Elzbieta Bienkowska, responsible for industrial policy in the internal market, slammed national agencies in November for failing to do their jobs and said her team was "working hard to present a proposal to strengthen the type-approval system and reinforce the independence of vehicle testing." A new EU parliamentary subcommittee plans to investigate over the course of an entire year the way the sector measures emissions. This loss of political goodwill could mean the next round of CO2 targets, due in early 2017, wind up closer to what environmentalists would like to see, hastening the disappearance of all combustion engines, not just diesels. Some EU lawmakers, unhappy with the pace at which the industry cuts carbon emissions, have been pushing for three years now to lower the 2025 limits to as little as 68g/km. "The problem created by Volkswagen has had a huge impact on the credibility of the automotive industry as a whole," said Carlos Tavares, the head of Europe's second-largest carmaker, PSA/Peugeot-Citroen, in an interview during the Geneva auto show. Never one to mince words and often a fierce critic of Volkswagen, Fiat Chrysler Automobiles CEO Sergio Marchionne told reporters during the show that carmakers are effectively walking around with a bull's-eye target painted on their backs. "It’s making our life much more difficult by far. And our reputation, I think, has suffered collectively," he said. Diesels are everywhere in Europe, accounting for every second car sold since 2006, up from only about a fifth in the 1990s. Worried about CO2-induced climate change, EU leaders gave preferential tax treatment to diesels because they emit roughly 20 percent less CO2 than gasoline engines. 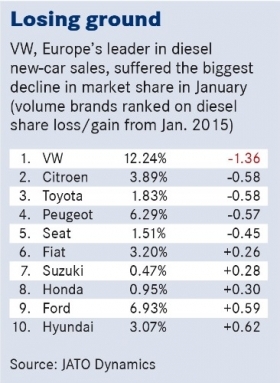 In doing so they created the only major market in the world where diesels rule. But the sky-high levels of carcinogenic nitrogen oxides (NOx) produced by VW Group's fraudulent Euro 5 diesels has sparked greater awareness about the health costs of the technology. The European Environment Agency considers NOx a road transport pollutant that is responsible for killing about 72,000 people annually in the EU. Stefan Bratzel, director of the Center of Automotive Management in Bergisch Gladbach, Germany, said the industry's troubles with regulators could have a decisive effect on demand for diesels in the coming decade. "When you talk to European policymakers, the frustration is actually quite considerable," he said. "They won’t be as industry friendly as hoped, and this will translate to an escalated tightening of CO2 limits. It's likely that for 2025 they could move for a target in the upper range of the corridor proposed, maybe 75-78g/km, and (achieving) that would only be possible with strong electrification of the fleet." Earlier this year carmakers barely survived a regulatory scare over legislation governing on-road emissions that might have killed diesels within the EU far sooner, according to Daimler CEO Dieter Zetsche. Under new Euro 6 norms, diesels in the laboratory must meet NOx targets of 80 milligrams per kilometer – roughly equivalent to the mass of four ants, according to Zetsche's chief powertrain engineer, Bernhard Heil. Once the diesels leave the test bench, however, there is no legal limit to what they can emit. Diesels, on average, produce from five to seven times the mandated level when on the road, leaving them on par with the decade-old Euro 3 standards. Amazingly enough, the International Council on Clean Transportation even estimates modern diesel cars produce more NOx on average under real driving conditions than a heavy-duty truck under the same scenario. Part of the reason why standards are so lax in the EU is that carmakers can choose where to homologate their cars, allowing them to play national type approval authorities against each other in a form of regulatory arbitrage. Volkswagen's budget brand Skoda, for example, neither uses its domestic Czech nor its parent's German agency but rather the UK authority. "What we need to remedy the situation is better enforcement and more real world testing," ICCT Senior Researcher Vicente Franco said. "It's not justifiable to have a car emitting [in some cases] 20 times its certified limit." This story is from the April issue of the Automotive News Europe monthly e-magazine, which is also available to read on our iPhone and iPad apps.You can download the new issue from April 4, as well as past issues by clicking here. When legislation designed to crack down on this practice was heavily watered down by EU member states, it quickly came under fire in the European Parliament. A vote in early February nearly vetoed the industry-friendly compromise, passing by just six votes with 61 abstentions, prompting the Guardian newspaper to write, "EU fails to close loopholes." Reuters, meanwhile, ran a story with the headline: "European carmakers survive politicians' backlash – for now." A day later, Zetsche conceded in Stuttgart that this so-called Real Driving Emissions (RDE) bill could have spelled the end for compression ignition engines had diesels been forced to actually meet the 80mg/km lab target for NOx in real life any time in the next few years. "They didn’t go so far as to make the use of diesel engines impossible," said the Daimler CEO, who currently serves as president of the European industry lobby ACEA. "This threat was under discussion." All carmakers have been subjected to a battery of tests to rule out further malfeasance, which cost them an incalculable amount of human and financial capital that could have been deployed elsewhere. "When a problem like this happens we look inside and say, 'Is something like this possible?' [at our company]. So you check it and you audit. I am certain that every single carmaker has spent time auditing their own powertrain and engines to make sure no one is playing games like this," Renault-Nissan CEO Carlos Ghosn said during a meeting with journalists last October. Renault and Fiat already had to make improvements to some of their vehicles to satisfy regulators. 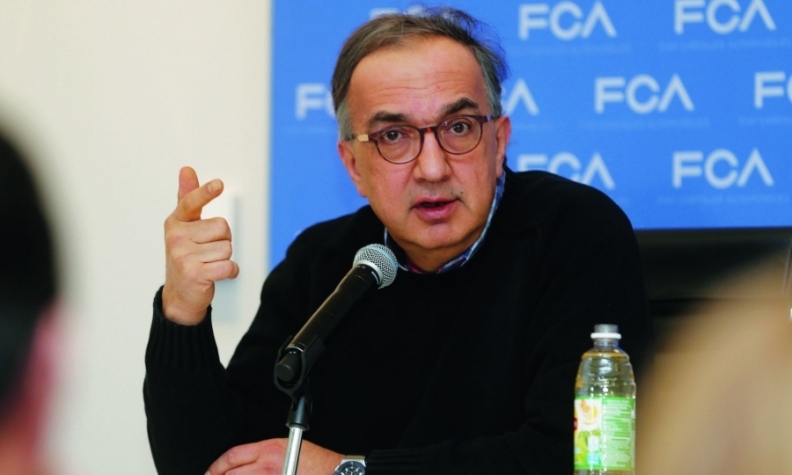 Said FCA's Marchionne: "It is taking an inordinate amount of time, both from the management side and in terms of the utilization of resources (…) to try and ensure that we will comply with the standards as they come forward. [This time drain] didn't exist before Dieselgate." The SkyActiv-D engines offered by Japanese carmaker Mazda are the only diesels in Europe to meet Euro 6 norms on the test bench by reducing NOx formation directly in the chamber through a combination of low compression ratios and exhaust gas recirculation. While this precludes risks stemming from the kind of poorly calibrated after-treatment systems found at Renault and Fiat, Mazda's European chief said his company also had to re-examine its testing regime. "All of that was brought out again to look at and say that everything was done properly," Mazda Europe CEO Jeff Guyton said in Geneva. "There was a significant discussion to ensure there was no such sort of defeat device." 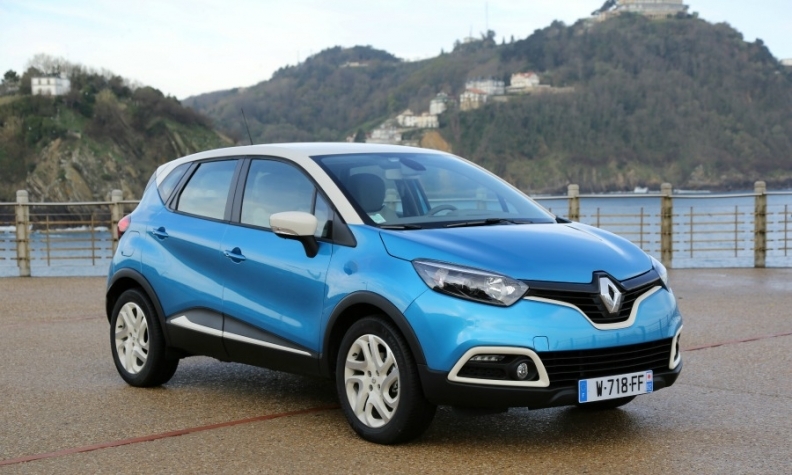 Renault is recalling diesel versions of the Captur SUV to fix pollution-control systems. The Captur came under scrutiny during a French government investigation sparked by VW's admission it cheated on emissions tests. So far, consumers seem to be siding with carmakers. Data shows demand for diesels barely took a dent in Europe, especially now that cheap oil undermines the case for buying expensive electric cars. Market research firm IHS Automotive said the three months after the scandal erupted late in September 2015 were actually the strongest for diesels last year. By comparison, diesel sales fared far worse during the financial crisis, when a shift away from large, premium cars in 2009 caused the penetration rate in Europe to sink to 45 percent. "European consumers see what they have to pay at the pump for diesel, which is still considerably less than gasoline," said Ernst & Young consultant Peter Fuss. "I don’t want to say that software manipulation on test benches is not entirely irrelevant but it plays only a subordinate role." This is forecast to change starting next year, which is when IHS predicts the market share for new diesel cars sold in Europe will fall below 50 percent and continue declining for the next decade. A key factor in the decrease is expected to be the move by automakers to add expensive exhaust after-treatment systems such as selective catalytic reduction (SCR) to meet the more demanding second stage of RDE legislation that takes effect in 2021. "What carmakers are most afraid of are the midterm and long-term consequences" the potential changes could have on their product planning, said ICCT's Franco, who estimates that adopting SCR across the board could add about 200 euros to the cost of a vehicle. "It might very well be that the cost of the diesel after-treatment system is higher than the cost of manufacturing the engine." Some executives were openly talking last month about preparing for the post-diesel era in which battery electric vehicles and hydrogen fuel cell cars deliver the kind of zero-emissions mobility that is the industry's Holy Grail. At the Geneva show one could already begin to hear the death knoll of the powerplant first patented by Rudolf Diesel in 1893. "There will come a day when it's not profitable any more to invest in diesel technology," BMW's new CEO, Harald Krueger, told reporters during the show last month. His new strategy, presented in mid-March, hinges in part on a roll out of electric cars. Previously, no carmaker – certainly no German premium brand – had dared to declare the diesel engine was living on borrowed time in Europe. Investment priorities are shifting as a result. Fresh from unveiling the most powerful diesel SUV in the market, the Audi SQ7, Knirsch said the next generation of his MLB Evo modular architecture, which is due in roughly 10 years, will be designed primarily with electric powertrains in mind rather than combustion engines. Meanwhile, Daimler's big announcement in Geneva was its decision to earmark half a billion euros to expand production of electric car batteries. Just to make sure Daimler's upper management clearly understood which direction to march, they were told from now on they would be issued plug-in hybrids or electric vehicles as company cars, rather than its latest Euro 6 diesels. Mercedes sales chief Ola Kaellenius, who next year will lead Daimler's r&d, explained: "We are making electric mobility an integral part of the everyday lives of our top management to set an example."